Mr. Adam Yates obtained a license for the Bird in Hand, George-street, some years since licensed as the Half Moon, and kept by Thomas Faro. 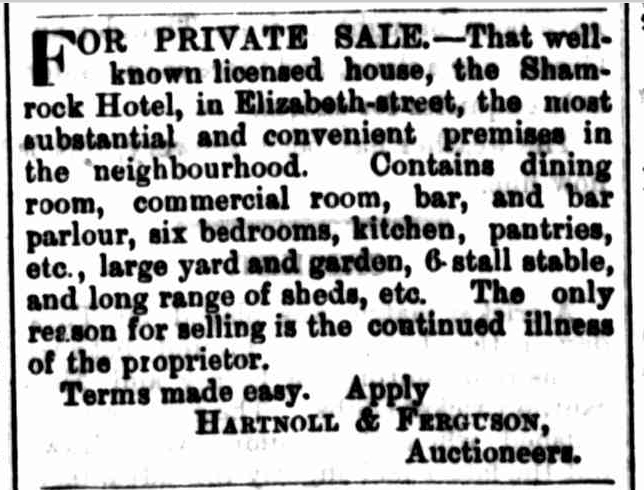 Mr. Sams gave “a history of the house,” from which It appeared that Faro proceeded rather hastily to Port Phillip, taking with him the license, and consequently a transfer could not be granted; the lease of the premises was sold for £100, and a license had since been refused. Mr. Knight begged permission to say a few words as proprietor of the property. The lease was sold for £200, and until it expired he had no authority to interfere: at the expiration of the lease he closed the house for three months, that it might lose its notorious character, and had now effected all necessary repairs and procured a respectable tenant. Mr. Midgley stated that the house was in good order, but the stables were of rather an ordinary description. Mr. Knight guaranteed to erect new stables, if the license was granted. There were one or two dissentients, but the majority voted in its favour. Mr. Rocher-And that yon have licensed ! Mr. Atkinson–Yes; but the “Bird in Hand,” I must say, is most disgraceful. 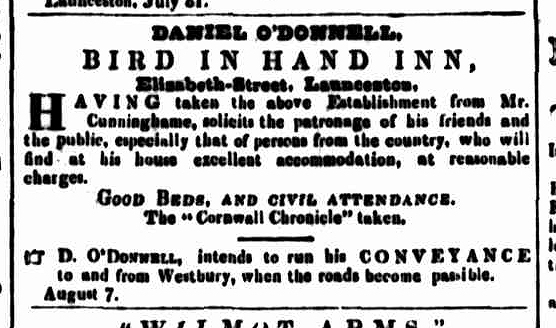 Daniel O’Donnell, Bird in Hand, Elizabeth-street- The question was put to the proprietor, whether Mrs. Clarke had any interest in the house. An answer in the negative was returned, and the license was granted. From George Summers. Bird in Hand, Elizabeth-street, to John Bailey. The police magistrate remarked that there had been some misunderstanding at the last annual meeting concerning these premises; there were some outbuildings connected with the establishment, which were not under the control of the landlord of the public house; this was contrary to the Licensing Act. Besides, the houses required sundry repairs, and if these repairs were not completed, he should suggest that the license be taken from the house. He need not say that there were many eligible premises for licenced houses in the town, whose owners would only be too glad to see them licensed. 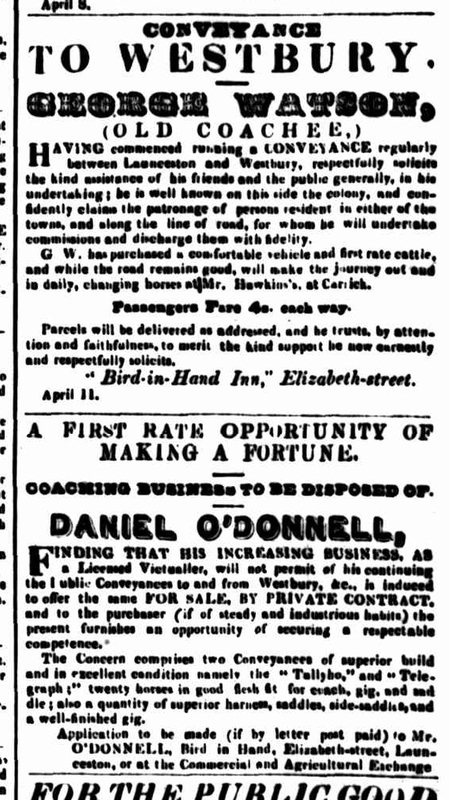 Mr. Gee, the proprietor of the Bird in Hand was in the court at the time, and promised to have the necessary repairs completed without delay On those conditions the transfer was granted. Back premises open; consideration postponed. John Hudson, Carpenter’s Arms, Charles and Canning Streets. 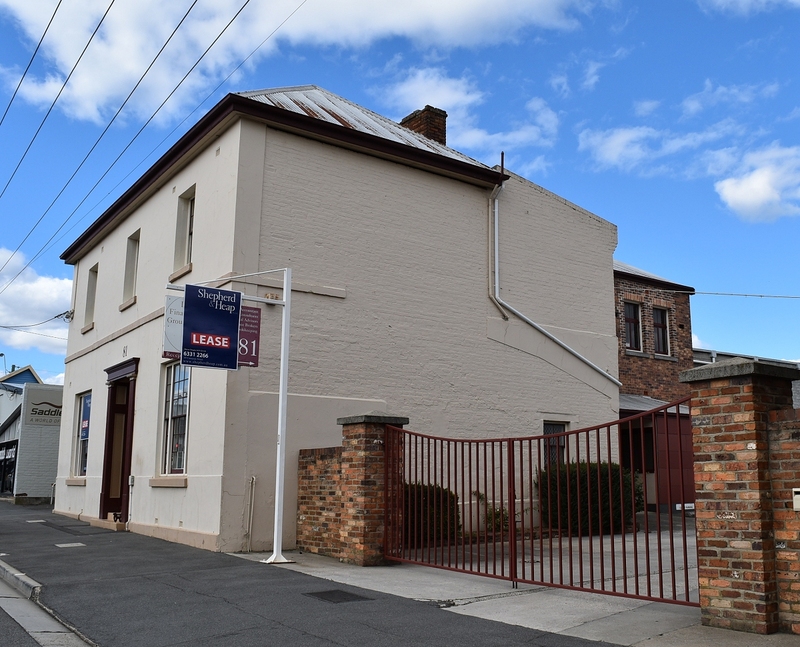 George Smith, Australian Wine Vault, George and York Streets, and James Spencer, “Bird in Hand,” Elizabeth Street, all granted–as the necessary fences had in each case been put up. yesterday, for a transfer of the license of the Bird-in-Hand from Mr Richard [Gee]. John Palmer alias “Little John”‘ when attempting to extinguish a fire in the kitchen chimney at the rear of the Shamrock Hotel on Monday, the brickwork gave way and he fell to the ground, sustaining some severe injuries. He was removed to his residence in Frankland Street. 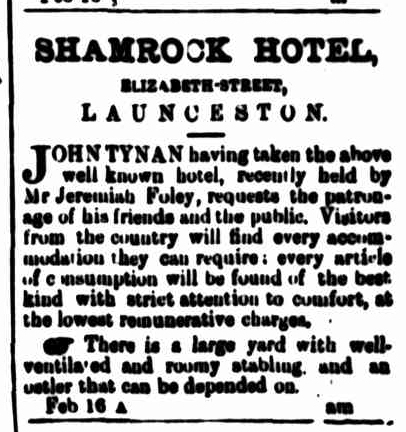 John Tynan, Shamrock Hotel, Elizabeth-street.-A report of applicant having had a disorderly house at 2 a m. on 14th April, 1867, had been furnished to the police. Applicant said they were country people, who retired to rest at a late hour.-Granted with a caution. The Fire Brigade.— One of the most Interesting demonstrations in connection with the visit of His Royal Highness Prince Alfred was the torch light procession on Tuesday evening of the Fire Brigades— red and blue, with their engines richly decorated with floral designs, surmounted with crowns. After separating at the Star Hotel, from which the procession started, the Blue Brigade headed by the band, marched down Wellington street, to Elizabeth-street, and halted at Mr John Tynan’s, the “Shamrock Hotel” where they were well entertained during the evening and the pleasant social party broke up about midnight with regrets and they met again at Mr. Tynan’s on Wednesday evening for the purpose of patronising him. 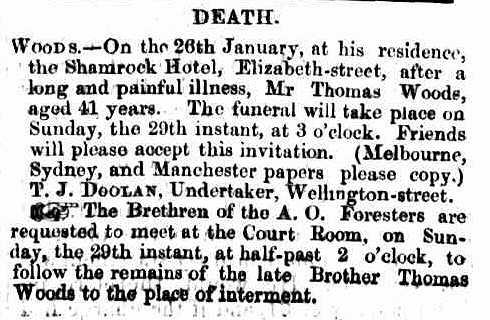 Mr Thomas Woods, for a license to the Shamrock Hotel, Elizabeth-street. The Shamrock Hotel.— Mrs Elizabeth Woods was authorised by the Police Bench on Friday to continue to sell liquors at the Shamrock Hotel under the license held by her late husband. Mr. Collins said the applicant was son of the owner of the house. The former tenant .had gone out, and the house had boon closed since. The Mayor said when he called to inspect the house it was closed, and he could not get in. Mr. Coulter was called, and said that the house was one of the seven he mentioned previously, and was not required. He did not think if the house was opened sufficient would be taken to pay the rent. APPLICATION FOR A NEW HOUSE. John White, applied for a license for the house in Elizabeth-street, formerly known as the Bird-in-Hand. Superintendent Coulter explained that the applicant applied for license to sell in a place to be called the Shamrock Hotel. It was situated in Elizabeth-street, and was formerly a licensed house, but of late years it had been closed. He had no objection to offer as to the applicant, the question was whether the place was necessary or not. Mr Croft presented a petition signed by 40 residents, objecting to the granting of a license to the place on the ground that it was unnecessary. Mr G. T. Collins appeared on behalf of the applicant, and said White had purchased the property and effected great improvements on it. The applicant possessed a good character. He (Mr Collins) had in his possession a petition signed by a number of residents in Elizabeth-street in support of the application. He would ask Mr Harrap what condition he found the place in when he visited it. Mr Harrap said he had no fault to find with the promises. The accommodation was good, and the house well found in every respect. Mr Murray moved that the application be not granted. Mr Grubb seconded the motion, which was carried. Mr Collins enquired if the application came before the meeting next year, should the place be better than the others in the neighbourhood, would the license be granted ? The Chairman answered that it was understood that a license would be refused at the next meeting to the worst of the houses. James White appealed against the decision of the Justices at the annual licensing meeting in refusing a license to the Shamrock Hotel, Elizabeth-street. The grounds set forth were that no sufficient reasons existed for the refusal, and the house was required in the neighbourhood. 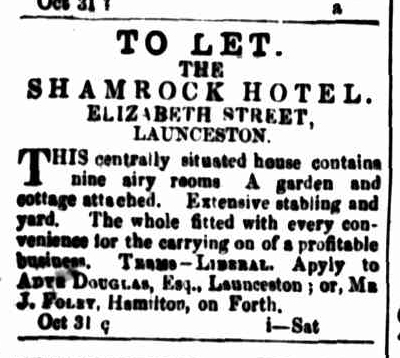 Mr. Collins appeared in support of the appeal which he stated was made on the grounds that the house was required in the neighbourhood, and that the population of Launceston was rapidly increasing, especially in the quarter where the place was situated. White was the owner of the property, and as he had spent all Isis money upon it he expected to obtain a license. 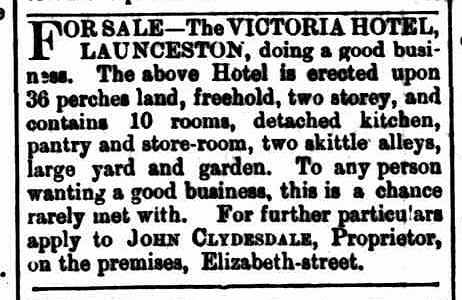 The population of Launceston had increased by about 5000 persons, since the house was licensed, and more hotels existed hero when there were less people than was the case at present. 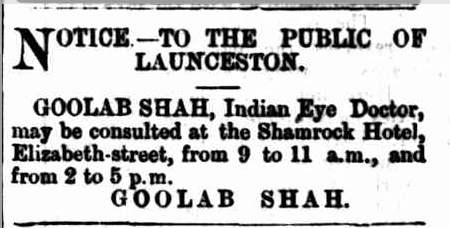 White for many years was engaged in auction rooms in Launceston and was a respectable man. He kept the house as a temperance hotel lately, and it was always full of lodgers. There was also a large floating population in and out of the town, and lodgings were required. The house was well suited for the accommodation of lodgers from the country districts. If the license was obtained White proposed to enlarge the premises. He (Mr. Collins) had a petition to which twenty-two signatures were attached testifying to White’s respectability. The house had been licensed for many years, but was now closed. Mr. Coulter said he opposed the granting of the license at the annual licensing meeting, and would do so again, as it was not wanted. The granting of a license would be a drawback to the neighbourhood, which was slowly recovering and becoming respectable. In that neighbourhood there were already too many public-houses. The place was unsuccessful as a licensed house before, and created brothels in its vicinity. Those places were now changing their character, and the whole of Elizabeth-street had become respectable. The house was undesirable as a hotel, as Elizabeth-street was the main road to the Church of the Apostles, where one of the largest congregations in town assembled, and it was necessary that no disorderly sights should be witnessed in the neighbourhood. He had no objection to White himself, who had never kept a hotel, and he therefore could not speak as to his fitness as a publican. The house was not fit to be licensed, there was no accommodation, and past experiments had proved it unsuccessful. Mr. Collins reiterated several of the statements he had previously made, and upon the Chairman putting the usual pro position to the Justices the appeal was upheld, and the license granted, there being 8 for and 5 against it. The Court then rose. THE SHAMROCK HOTEL–At the Police Court yesterday morning John Clydesdale applied for permission to sell liquors in the Shamrock Hotel, Elizabeth-street, and stated in his application that it was his intention to ask for a transfer of the place from the present landlord, John White, to himself at the next Quarterly Licensing Meeting. The application was opposed by Superintendent Coulter, who was of the opinion that the place was not fit to be licensed. Mr Coulter had opposed the granting of a license to the house upon several previous occasional with success, and it was not until an appeal was made by White at the Court of General Sessions, held on January 8, against the decision given at the Annual Licensing Meeting that his application was ultimately granted. The applicant, John Clydesdale, did not put in an appear yesterday morning, and in the face of the objection of the Superintendent of Police, the Bench refused the application. The following transfers were applied for: Shamrock Hotel, Elizabeth-street, from John White to John Clydesdale. Mr. Collins appeared to support the application. He stated that Mr. White had been obliged to go to Melbourne for the purpose of undergoing an operation for cancer in the face, and was obliged to sell his hotel, as the complaint from which he suffered incapacitated him from carrying on the business. Superintendent Coulter stated that the license was twice refused, and only granted on an ap peal, of which the police and neighbours knew nothing. There was no objection to Mr. White or to Mr. Clydesdale, but there was to the house, which was not required. The Chairman pointed out that they were not dealing with a new license, but with one actually existing. He then put the proposal for granting the transfer to the vote, and it was lost by eight votes to four. LICENSING APPEALS.— At the Court of General Sessions yesterday, two appeals were heard against the refusal of the Quarterly Licensing Bench to grant licensing transfers, namely, that of the Shamrock Hotel, Elizabeth street, from Thomas White to John Clydesdale, and of the City Hotel from John Hollington to James Reading. There was no evidence brought forward to sustain the decisions of the Licensing Bench, and both transfers were accordingly granted. License to Sell. 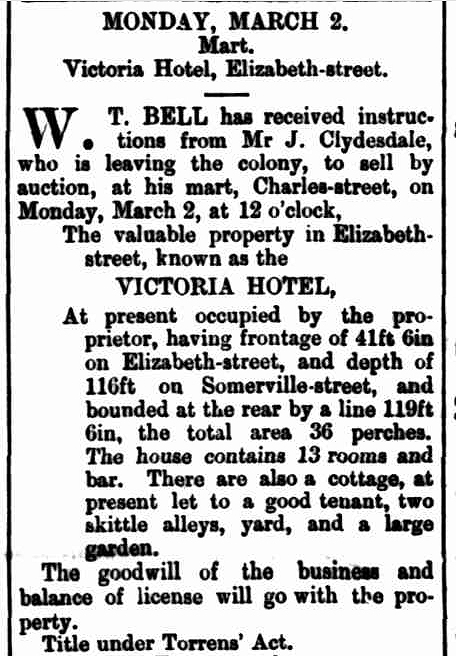 — Mr. G. T. Collins made an application on behalf of Charles Delwood for permission to sell liquors under the license now held by John Clydesdale, in the Victoria Hotel, until the next quarterly licensing meeting. The application was granted. Michael B. Lawler, Victoria Hotel, Elizabeth-street. The superintendent of police said there were no objections to the manner in which this house had been conducted, but as in previous years he had objected to the license, he was, therefore, compelled to do so this year on the ground that a licensed house was not required in the neighborhood. He had pointed out before that if the hotel were licensed it would deteriorate the neighborhood, and that deterioration had already resulted, for there were few houses in the locality that were not houses of ill-fame. Mr Lawler had always conducted the business in an orderly manner, but the hotel was injurious to the inhabitants. The chairman said he had always heard Mr Lawler highly spoken of as a licensed victualler. After further remarks of a complimentary nature as to Mr Lawler’s fitness for conducting an hotel the license was granted. INTERIM LICENSE.-Elizabeth .Jesseimie was granted permission to sell liquors at the Victoria Hotel under the licence held by the late Michael Lawler until the next meeting of the Licensing Bench. A bagatelle license was granted to Elizabeth J. Lawler for the Victoria hotel. The work of altering the old Burnie Hotel at Launceston in order to convert it into a Trades hall was commenced yesterday. 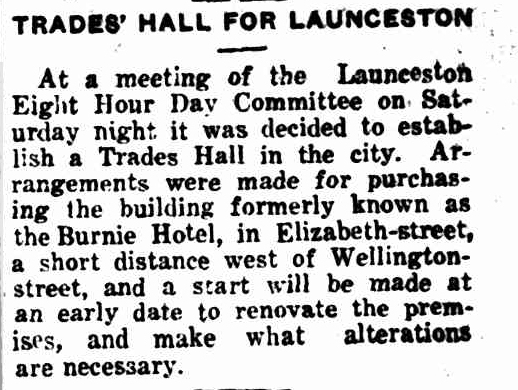 Previously there has been no Trades hall at Launceston The plans allow for two large meeting rooms and a considerable number of offices Some thirty unions have combined to bring about this desirable improvement m the welfare of industrialists in the North It is expected that I the hall will be ready for occupation at the New Year. This entry was posted in Brisbane Street, Elizabeth Street, George Street and tagged location, no location, no photo, photo by Xenith. Bookmark the permalink.